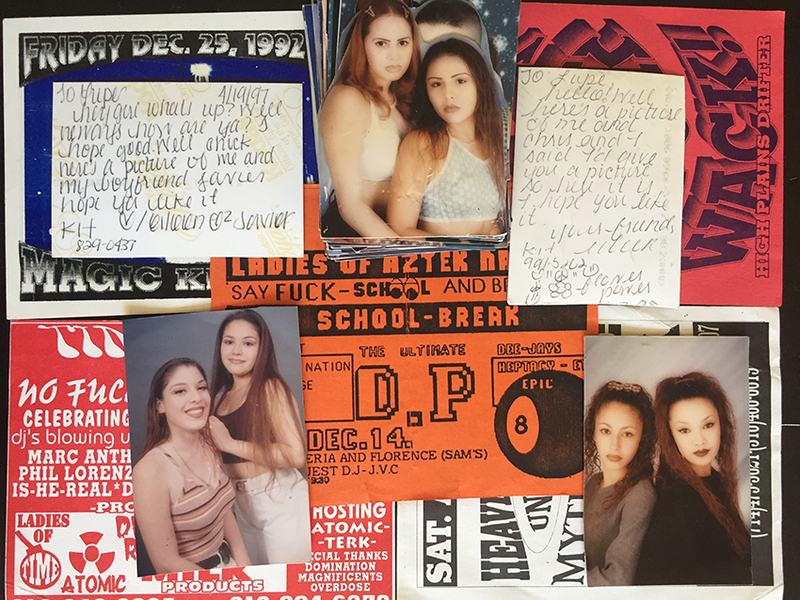 Guadalupe Rosales, Selections of Glamour shots and Party flyers (1990s). Collage, dimensions vary. Image courtesy of the artist and Vincent Price Art Museum. 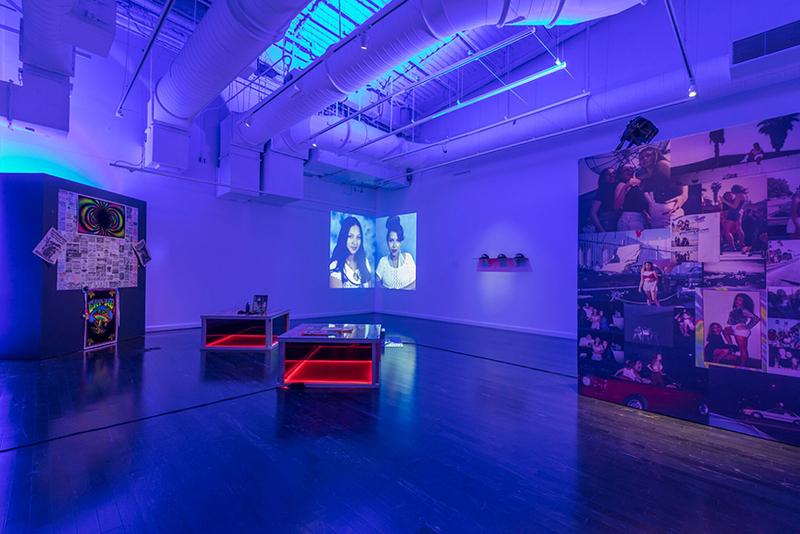 Guadalupe Rosales’ first solo museum show, Echoes of a Collective Memory at the Vincent Price Art Museum (VPAM), expands her well-established archival capacites. 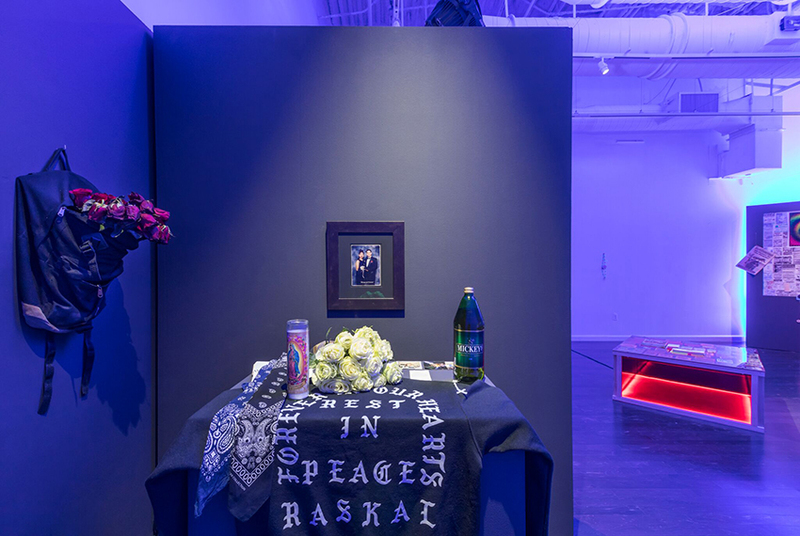 She gives space to the ephemeral detritus of pre-digital life in a multi-part installation that delves into ‘90s rave culture in the SoCal Latinx community. Rosales has already proven herself adept at capturing such culture online—if there’s an argument worth making in defense of social media, her open-source Instagram archives, Veteranas and Rucas (est. 2014) and Map Pointz (est. 2015), make it. Scrolling through the more than 5,000 photographs and videos Rosales has posted, celebrating generations of Latinx raised in Southern California, is like unlocking a digital time capsule. The posts teem with personalized descriptions about the people pictured, allowing the project to transcend superficial, algorithmic likes and instead reincarnate a distinct cultural moment that played out before the digital sphere exerted its insidious influence. That Rosales champions the power of communal self-representation differentiates her work from typical online nostalgia rabbit holes. A purple glow saturates her installation at VPAM—walls, shelves and tables are adorned with trippy posters, concert passes, hand-written letters, baseball caps, photos of loved ones, makeup, and perfume bottles. 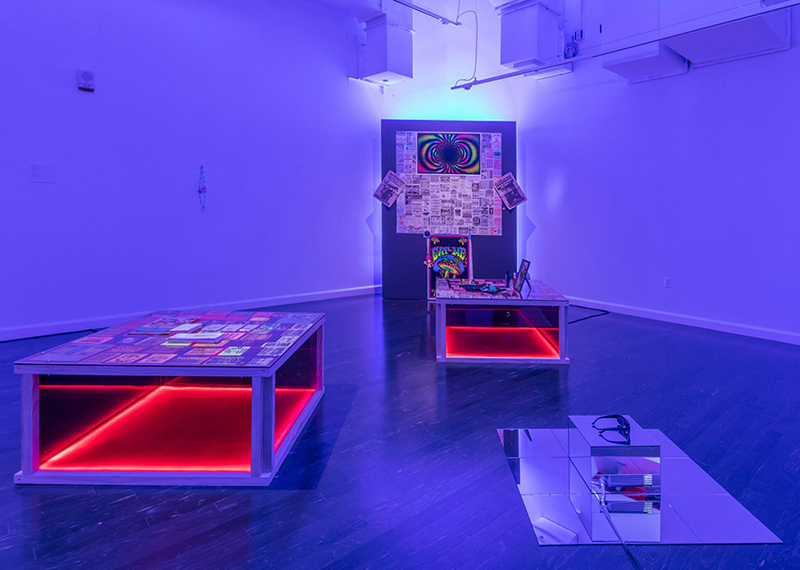 Two tables underlit by red neon, the kind typically used as go-go dancing platforms, function as display cases, or perhaps reliquaries, presenting original party flyers, newspaper clippings, and studio portraits. A video projector, housed in a mirrored-tiled case reminiscent of a dancefloor, plays footage of self-possessed teens showing off their dance moves and indomitable ‘90s styles that have come back into fashion today like crop tops, high-waisted jeans, and overalls. By paying immaculate attention to every physical detail, Rosales transforms the footage, photos, and flyers that she has collected through her Instagram accounts into an exalted physical space resonating with cultural vibrancy. Amidst the teenage exuberance, however, is the undertone of loss. Around the corner from the main installation, Rosales has built a memorial to her cousin Ever Sanchez, who was fatally wounded in a knife fight in 1996. Lodged in the ephemerality of the assembled objects—a sweatshirt, candle, backpack, a Mickey’s bottle, a high school prom portrait—is the perilous impact of gang violence on the party scene. Outside of the gallery, is a payphone playing pre-recorded party announcements from two decades ago. In any other context, the retro effect may seem gimmicky or perversely haunting, but in this case the voice emanating from the phone is one more tribute to the resilience of Latinx youth culture in southern California. Guadalupe Rosales: Echoes of a Collective Memory runs from September 15, 2018–January 19, 2019 at the Vincent Price Museum (East Los Angeles College, 1301 Avenida Cesar Chavez, Monterey Park, CA 91754-6099). 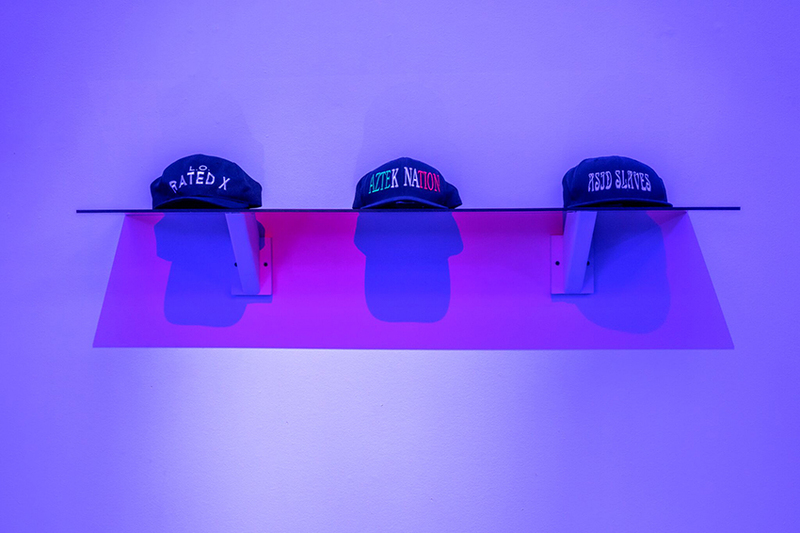 Guadalupe Rosales, Echoes of a Collective Memory (2018) (installation view). Image courtesy of the artist and Vincent Price Art Museum. Photo: Monica Orozco. Guadalupe Rosales, Latinas Mapping the City (1994-1998). Mural collage, 96 x 72 inches. Image courtesy of the artist and Vincent Price Art Museum.